Dot has teamed up with Ridgefield Kayak to offer creativity workshops on the water. letting nature be our guide and our muse. We meet at 6 PM, the paddle begins at 6:30; we will stop for writing time along the river and return about 9. 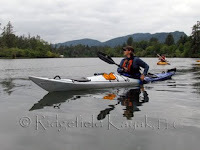 Cost: $55 each session, which includes kayak rental, paddle, guide, and PFD. Pre-registration is required by contacting Ridgefield Kayak at (360) 727-3120 or (503) 319-1146 and paying the $35 paddling fee. The balance of $20 is due at the time of the workshop, payable to Dot Hearn.